Winding across 640 kilometers of southeastern Australia’s landscape, the Murray-Darling river system often struggles to sustain its environment and much of the country’s agriculture. Now a proposed plan for the basin is fueling intense debates about the best ways to manage Australia’s largest river system. CANBERRA, Australia — The latest phase in a long process to adopt new water use regulations for the ailing Murray-Darling Basin has pitted states against states and environmentalists against irrigators in a hot-button debate about the best ways to manage Australia’s largest river system and prime food-growing region. The draft plan for the basin is among the most important changes in the country’s water policy, as it aims to balance environmental and socio-economic interests in a highly productive region that suffers both intense floods and dire droughts, and lies at the heart of Australia’s progressive water-trading market. Irrigators in three key basin states have rejected the proposed plan, arguing that in cutting the share of water allocated to farmers, the plan would cost thousands of jobs and destroy irrigation communities. The draft plan was controversial from its inception. Rural communities in the Murray-Darling region reacted angrily to the proposed water cuts outlined in the initial management plan for the basin that was released in October 2010, arguing that it would cause irreversible damage to agriculture, rural towns and lifestyles. The first draft proposed the reduction of water entitlements in the region by 3,000 to 4,000 gigaliters, or 3 billion to 4 billion cubic meters (793 billion to 1.1 trillion gallons) compared to 2009 — to protect the river system’s environment. The Murray-Darling Basin Authority (MDBA) then reduced the proposed cut to 2,750 gigalitres, or 2.75 billion cubic meters (726 billion gallons), but that failed to relieve the concerns of irrigators. The public backlash was followed in December 2010 by the shocking resignation of Mike Taylor as MDBA chair. But as the 20-week public consultations over the proposed plan ended last week, the document looks certain to trigger another round of intense legal battles over state water entitlements. 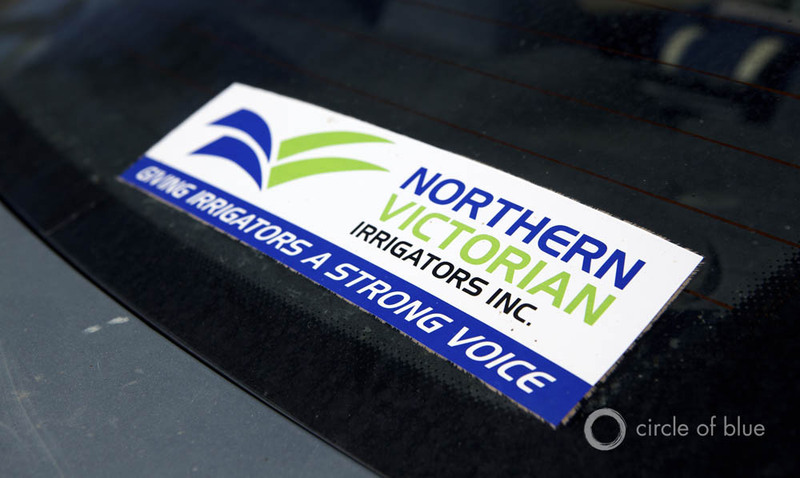 New South Wales and Victoria have rejected the plan — which recommends returning 2,750 gigaliters, or 2.75 billion cubic meters (726 billion gallons), of water a year to the river system — arguing that it takes away too much from their irrigators. South Australia has also lashed the proposal, saying that it does not return enough water to the environment. Queensland got an extension to submit its feedback. Speaking before the release of his government’s submission about the plan, Jay Weatherill, premier of South Australia, said last week that the document gives other states “too much wriggle room” on cooperating in the delivery of water and criticized them for what he said was a history of bad river management. Weatherill’s remarks came mere days after the premier of New South Wales, Barry O’Farrell, forecast that South Australia would soon be “squealing” about the abundance of water in the system. Australian media have suggested that the plan will almost certainly be challenged in the country’s High Court by at least one, and maybe even all, of the three key basin states. As the consultation period was drawing to a close, more than 60 Australian academics released a joint statement that slammed the document for its lack of transparency. According to the scientists, the draft plan falls short of securing the long-term sustainability of the Murray-Darling river system, and it fails to take into account future climate change projections and other trends that could affect the water in the basin. Cutting Losses or Reaping Rewards? A recent report by the Commonwealth Scientific and Industrial Research Organisation (CSIRO), Australia’s science body, concluded that the plan would reap between AUS $3 billion and AUS $8 billion ($US 3.1 billion to $US 8.3 billion) in ecological benefit but is still unlikely to solve all of the region’s environmental problems. Meanwhile, New South Wales irrigators and farmers released their own submissions, arguing that — by cutting irrigators’ share of the water — the plan would cost thousands of jobs and destroy irrigation communities. The proposed draft estimates hundreds of billions of dollars lost annually in irrigated agriculture and the elimination of 800 to 1,600 full-time jobs, though the MDBA says there is uncertainty about the multiplier effects in farming communities, where much of the economic activity indirectly supports agriculture. Among the most contentious issues are the proposed sustainable diversion limits (SDLs), or the amount of water that can be taken from the river system for irrigation, agriculture, drinking, and other consumptive uses. The extraction of too much water in the basin — currently about 13,700 gigaliters, or 13.7 billion cubic meters (3.6 trillion gallons) a year — has increased the salinity of water, triggered frequent algal blooms, and damaged important wetlands, eucalyptus forests, and wildlife, especially during droughts. To rescue the region’s rivers, the plan proposes limiting surface water use in the basin to 10,873 gigaliters, or 10.8 billion cubic meters (2.9 trillion gallons), annually and recommends that irrigators return 2,750 gigaliters to the river system each year. Climate projections suggest that the Murray-Darling Basin will likely get drier. Amid extensive flooding in eastern Australia at the start of this year, the New South Wales water minister said that the wet weather makes the need to implement a new Murray-Darling Basin plan less urgent. But some scientists say that the basin is, in fact, going to get drier and that the current draft plan has failed to factor in climate projections. CSIRO modeling suggests that the amount of water available in the Murray-Darling system could increase by up to 7 percent by 2030 if tropical storms in the summer move in the northern basin, or water availability could decrease by up to 37 percent if winter storms get pushed into the southern ocean. Under a median scenario, CSIRO expects that the average surface water availability could fall by 12 percent. “The government’s proposal in the Murray-Darling Plan is essentially not to make any changes to the water availability due to the likelihood of climate change. This is extremely risky,” said Dr. James Pittock of Australian National University. “And that’s risky for a number of reasons. One is that they are focused on this 12 percent median scenario for 2030. The CSIRO said that’s median. Some of these reductions had already been achieved in certain rivers through infrastructure improvements and federal buybacks. Under that system, the Australian government has, so far, paid irrigators more than AUS $1 billion to purchase some 670 gigaliters, or 670 million cubic meters (177 billion gallons), of entitlements for the environment. Richard Davis, member of the Wentworth Group of Concerned Scientists and former chief science advisor to Australia’s National Water Commission (NWC), told Circle of Blue in a December interview that the latest draft is a step back from current arrangements, as it decreases the water taken from agriculture and leaves too little water for the river system. Agriculture uses some 11,000 gigaliters, or 11 billion cubic meters (2.9 trillion gallons), a year from the Murray-Darling. Meanwhile, there are some 19,000 gigaliters, or 19 billion cubic meters (5.0 trillion gallons), currently available for the environment. To have good chances of restoring the environment, the plan should take half of agriculture’s share — between 4,000 and 7,000 gigaliters, or 4 billion and 7 billion cubic meters (793 billion to 1.1 trillion gallons) — and return it to rivers and streams, Davis said. Yet Craig Knowles, the current chairman of the Murray-Darling Basin Authority (MDBA) — the government agency in charge of the plan — warned that diverting 4,000 gigalitres (793 billion gallons) to the environment could mean that towns and homes might have to be moved to avoid inundation. “It’s not the volume of water, it’s what you do with the water – it’s about how you manage it,” he told AAP. Following the submissions period, the plan would go through the federal government before it gets presented to Australia’s Parliament, which would have the final say on the shape of any cuts in water allocations. The diversions will be phased in slowly, with full implementation of the plan not expected until 2019. But as farmers and irrigators worry that the plan could leave them with too little water, others counter that many of the reductions could be offset with water use efficiencies and trading. Water markets have helped most regional communities in the southern Murray–Darling Basin to remain productive, even during drought, according to a new report released on April 17 by the National Water Commission (NWC). During the 12-year dry spell that ended in 2010, while the water extraction for farmers fell by as much as 70 percent in some areas, the value of food production remained the same or dropped only slightly, Pittock said. The reason — in addition to higher commodity prices — is that the market allowed the water to be reallocated to the most productive uses, creating a more efficient economy. Before the drought, vast amounts of the irrigation water in the basin were wasted or used for low-value crops. During the dry period, many farmers sold their entitlements to higher-value producers, such as vineyards and fruit orchards. Meanwhile, water use efficiency increased some 40 percent in both cities and rural areas. Trading grew markedly during the period, according to the NWC report. In some years, irrigators in the Murray-Darling traded more than 30 percent of announced allocations and 10 percent of entitlements. Interregional and intraregional water trading reduced the impact of the drought on regional gross domestic product in the southern Murray-Darling Basin from AUS $11.3 billion to AUS $7 billion ($US 11.8 billion to $US 7.2 billion) between 2006 and 2011. In Australia’s two-tier water rights system, entitlements are a permanent right to a share of the total water available. Allocations are a right to a specific, seasonal volume of water granted to an entitlement holder; they are for temporary use when traded. A decade ago, 1,000 cubic meters (264,000 gallons) traded for AUS $2 in Australia. At the peak of the market in 2009, the same volume sold for AUS $1,300 to $2,400 ($US 1,340 to $US 2,475). While nearly AUS $3 billion in rights was traded in 2009, prices have dropped since, due to more rain and changes in the government’s purchasing system. Critics say that without better regulations, such as limitations on holdings, water rights can become consolidated in the hands of a few. Others fear that the market would leave out the interests of the environment. 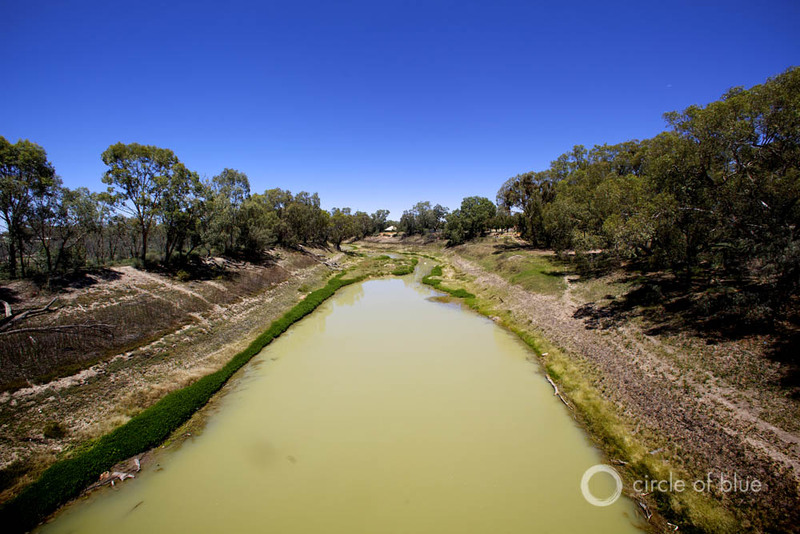 To find out more about the 12-year drought in the Murray-Darling Basin, check out Circle of Blue’s interactive package, The Biggest Dry, from when our team was on the ground in May 2009.